I've been working on this quilt for longer than I'd like to remember. It started as a bee block but I wanted it much bigger than the number of blocks I had. It languished for almost a year while I was sidetracked with other projects. It was partially quilted until I decided I hated the quilting and unpicked it all! 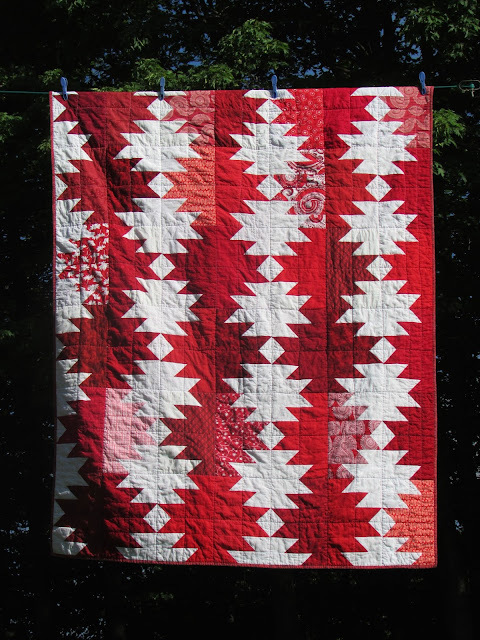 Finally, a dear friend's daughter announced her wedding plans and I knew that this quilt was the ideal gift for her. 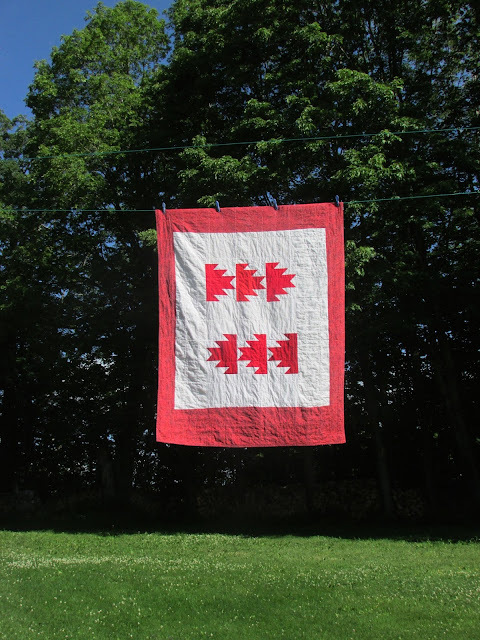 So, since July 1 isn't far away and red and white are iconic colours, I'm calling this Canada 150, my personal homage to my home and country. It isn't perfect, it isn't glamorous, much like Canada itself, but I love it and hope that Kayla will too. It's a full double bed size quilt so I went for simple quilting. It wasn't easy to wrestle it through the sewing machine, but if done in small doses, it went well. I like the back too and think it looks very flag like hanging from the clothes line. I used a thin batting so it is soft, drapes well, and isn't too heavy. It's not always easy to get a good shot with all the wind we're getting these days! Oh my -- what a beautiful quilt! I'm sure the bride will be delighted! Love your Canada Day Quilt! It is a pleasure to see all the red and white, especially the Maple Leafs. Thank you for sharing your beautiful quilt. Your quilt is beautiful! 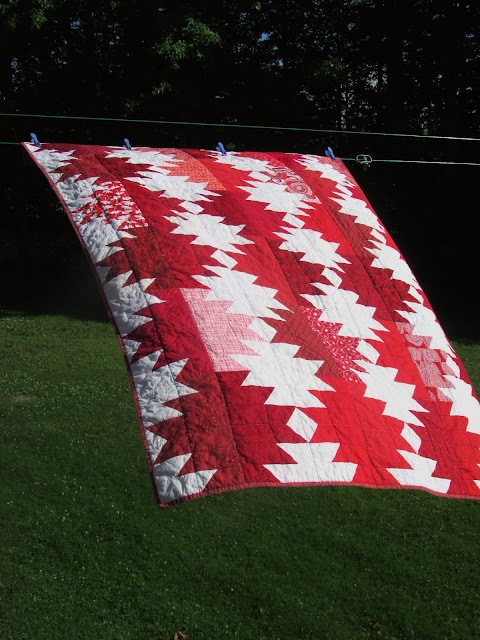 I need to make a red and white quilt soon. It has been on my bucket list for quite some time. I meant to add, I hope you don't mind if I put it on my Pinterest board. Thanks. It's beautiful! What a lucky bride! Thanks for sharing this informetion . we are Packers and Movers in Bangalore if you want any help please contact us thank . Shraddha English is among the best English speaking institute in Hyderabad offers spoken english classes in hyderabad by experts that helps you to sharpen your communication skills.